The 2013 SA Cheese Festival was awarded the EXSA Best Outdoor Venue Exhibition in Southern Africa in the Trade & Consumer category of 12000m² and over. 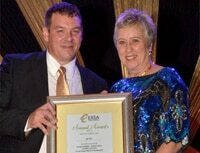 This is the second year in a row and the fourth time since Agri-Expo became a member of EXSA in 2007. No wonder this event annually draws crowds in excess of 30 000 for the pure enjoyment of cheese and its scrumptious gourmet partners. EXSA, via collective representation, provides a forum for all participants across the spectrum of the exhibition industry. EXSA sets standards and ethics amongst its members and endeavours to create a professional image for the industry as a whole. EXSA provides a platform for arbitration and mediation in the event of disputes between members and/or exhibitors. EXSA provides recognition to members and exhibitors by judging exhibition stands and exhibitions, thus developing excellence within the industry. EXSA lobbies at government level on legislation affecting the exhibition industry. EXSA provides an information collection and dissemination service to all interested parties, both locally and internationally.